Neptune is not visible to the unaided eye and is the only planet in the Solar System found by mathematical prediction rather than by empirical observation. Unexpected changes in the orbit of Uranus led Alexis Bouvard to deduce that its orbit was subject to gravitational perturbation by an unknown planet. 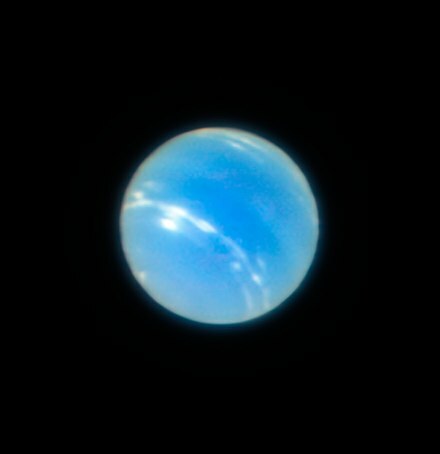 Neptune was subsequently observed with a telescope on 23 September 1846  by Johann Galle within a degree of the position predicted by Urbain Le Verrier. 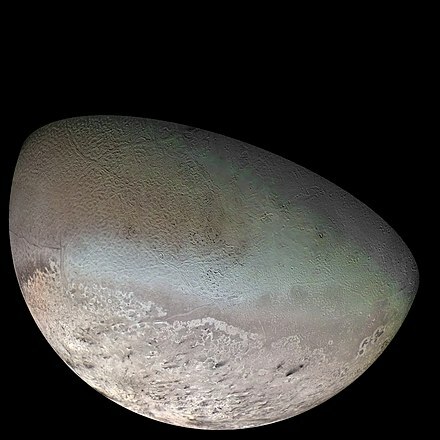 Its largest moon, Triton, was discovered shortly thereafter, though none of the planet's remaining known 13 moons were located telescopically until the 20th century. The planet's distance from Earth gives it a very small apparent size, making it challenging to study with Earth-based telescopes. Neptune was visited by Voyager 2 , when it flew by the planet on 25 August 1989. The advent of the Hubble Space Telescope and large ground-based telescopes with adaptive optics has recently allowed for additional detailed observations from afar. 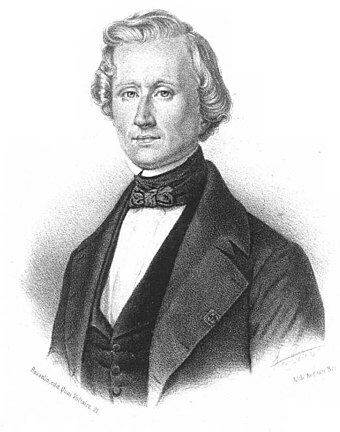 Alexis Bouvard was a French astronomer. He is particularly noted for his careful observations of the irregularities in the motion of Uranus and his hypothesis of the existence of an eighth planet in the solar system. In astronomy, perturbation is the complex motion of a massive body subject to forces other than the gravitational attraction of a single other massive body. The other forces can include a third body, resistance, as from an atmosphere, and the off-center attraction of an oblate or otherwise misshapen body. The Great Dark Spot was one of a series of dark spots on Neptune similar in appearance to Jupiter's Great Red Spot. GDS-89 was the first Great Dark Spot on Neptune to be observed in 1989 by NASA's Voyager 2 spaceprobe. Like Jupiter's spot, Great Dark Spots are anticyclonic storms. However, their interiors are relatively cloud-free, and unlike Jupiter's spot, which has lasted for hundreds of years, their lifetimes appear to be shorter, forming and dissipating once every few years or so. Based on observations taken with Voyager 2 and since then with the Hubble Space Telescope, Neptune appears to spend somewhat more than half its time with a Great Dark Spot. The Great Red Spot is a persistent high-pressure region in the atmosphere of Jupiter, producing an anticyclonic storm, the largest in the Solar System, 22 degrees south of the planet's equator. It has been continuously observed since 1830. Earlier observations from 1665 to 1713 are believed to be of the same storm; if this is correct, it has existed for at least 350 years. Such storms are not uncommon within the turbulent atmospheres of gas giants. John Couch Adams was a British mathematician and astronomer. He was born in Laneast, near Launceston, Cornwall, and died in Cambridge. Most languages today use some variant of the name "Neptune" for the planet; indeed in Chinese, Vietnamese, Japanese, and Korean, the planet's name was translated as "sea king star" (海王星). In Mongolian, Neptune is called Dalain Van (Далайн ван), reflecting its namesake god's role as the ruler of the sea. In modern Greek the planet is called Poseidon (Ποσειδώνας, Poseidonas), the Greek counterpart of Neptune. In Hebrew, "Rahab" (רהב), from a Biblical sea monster mentioned in the Book of Psalms, was selected in a vote managed by the Academy of the Hebrew Language in 2009 as the official name for the planet, even though the existing Latin term "Neptun" (נפטון) is commonly used. In Māori, the planet is called Tangaroa, named after the Māori god of the sea. In Nahuatl, the planet is called Tlāloccītlalli, named after the rain god Tlāloc. In Thai, Neptune is referred both by its Westernised name Dao Nepjun (ดาวเนปจูน), and is also named Dao Ketu (ดาวเกตุ, "Star of Ketu"), after the descending lunar node Ketu (केतु) who plays a role in Hindu astrology. Neptune's mass of 1.0243×1026 kg  is intermediate between Earth and the larger gas giants: it is 17 times that of Earth but just 1/19th that of Jupiter. [lower-alpha 4] Its gravity at 1 bar is 11.15 m/s2, 1.14 times the surface gravity of Earth,  and surpassed only by Jupiter. Neptune's equatorial radius of 24,764 km  is nearly four times that of Earth. Neptune, like Uranus, is an ice giant, a subclass of giant planet, because they are smaller and have higher concentrations of volatiles than Jupiter and Saturn. In the search for extrasolar planets, Neptune has been used as a metonym: discovered bodies of similar mass are often referred to as "Neptunes",  just as scientists refer to various extrasolar bodies as "Jupiters". Neptune's atmosphere is subdivided into two main regions: the lower troposphere, where temperature decreases with altitude, and the stratosphere, where temperature increases with altitude. The boundary between the two, the tropopause, lies at a pressure of 0.1 bars (10 kPa). The stratosphere then gives way to the thermosphere at a pressure lower than 10−5 to 10−4 bars (1 to 10 Pa). The thermosphere gradually transitions to the exosphere. Neptune differs from Uranus in its typical level of meteorological activity. Voyager 2 observed weather phenomena on Neptune during its 1989 flyby,  but no comparable phenomena on Uranus during its 1986 fly-by. The axial tilt of Neptune is 28.32°,  which is similar to the tilts of Earth (23°) and Mars (25°). As a result, Neptune experiences similar seasonal changes to Earth. The long orbital period of Neptune means that the seasons last for forty Earth years. Its sidereal rotation period (day) is roughly 16.11 hours. Because its axial tilt is comparable to Earth's, the variation in the length of its day over the course of its long year is not any more extreme. 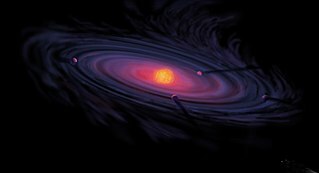 An alternative concept is that they formed closer to the Sun, where the matter density was higher, and then subsequently migrated to their current orbits after the removal of the gaseous protoplanetary disc. This hypothesis of migration after formation is favoured, due to its ability to better explain the occupancy of the populations of small objects observed in the trans-Neptunian region. The current most widely accepted    explanation of the details of this hypothesis is known as the Nice model, which explores the effect of a migrating Neptune and the other giant planets on the structure of the Kuiper belt. The first of these planetary rings was detected in 1968 by a team led by Edward Guinan. In the early 1980s, analysis of this data along with newer observations led to the hypothesis that this ring might be incomplete. Evidence that the rings might have gaps first arose during a stellar occultation in 1984 when the rings obscured a star on immersion but not on emersion. 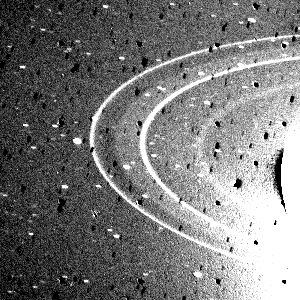 Images from Voyager 2 in 1989 settled the issue by showing several faint rings. After the Voyager 2 flyby mission, the next step in scientific exploration of the Neptunian system, is considered to be a Flagship orbital mission. Such a hypothetical mission is envisioned to be possible in the late 2020s or early 2030s. However, there have been discussions to launch Neptune missions sooner. In 2003, there was a proposal in NASA's "Vision Missions Studies" for a "Neptune Orbiter with Probes" mission that does Cassini -level science. Another, more recent proposal was for Argo , a flyby spacecraft to be launched in 2019, that would visit Jupiter, Saturn, Neptune, and a Kuiper belt object. The focus would be on Neptune and its largest moon Triton to be investigated around 2029. The proposed New Horizons 2 mission (which was later scrapped) might also have done a close flyby of the Neptunian system. ↑ Mass of Triton: 2.14×1022 kg. Combined mass of 12 other known moons of Neptune: 7.53×1019 kg, or 0.35%. The mass of the rings is negligible. The Kuiper belt, occasionally called the Edgeworth–Kuiper belt, is a circumstellar disc in the outer Solar System, extending from the orbit of Neptune to approximately 50 AU from the Sun. It is similar to the asteroid belt, but is far larger—20 times as wide and 20 to 200 times as massive. Like the asteroid belt, it consists mainly of small bodies or remnants from when the Solar System formed. While many asteroids are composed primarily of rock and metal, most Kuiper belt objects are composed largely of frozen volatiles, such as methane, ammonia and water. The Kuiper belt is home to three officially recognized dwarf planets: Pluto, Haumea and Makemake. Some of the Solar System's moons, such as Neptune's Triton and Saturn's Phoebe, may have originated in the region. Triton is the largest natural satellite of the planet Neptune, and the first Neptunian moon to be discovered. The discovery was made on October 10, 1846, by English astronomer William Lassell. It is the only large moon in the Solar System with a retrograde orbit, an orbit in the direction opposite to its planet's rotation. At 2,710 kilometres (1,680 mi) in diameter, it is the seventh-largest moon in the Solar System, the only satellite of Neptune massive enough to be in hydrostatic equilibrium and the second-largest planetary moon in relation to its primary, after Earth's Moon. Because of its retrograde orbit and composition similar to Pluto's, Triton is thought to have been a dwarf planet captured from the Kuiper belt. 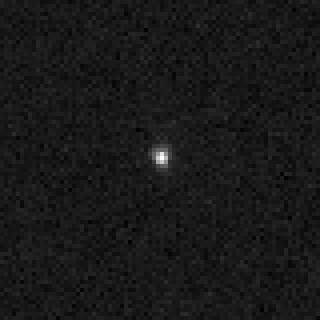 90377 Sedna is a large minor planet in the outer reaches of the Solar System that was, as of 2015, at a distance of about 86 astronomical units (1.29×1010 km; 8.0×109 mi) from the Sun, about three times as far as Neptune. Spectroscopy has revealed that Sedna's surface composition is similar to that of some other trans-Neptunian objects, being largely a mixture of water, methane, and nitrogen ices with tholins. Its surface is one of the reddest among Solar System objects. It is most likely a dwarf planet. Among the eight largest trans-Neptunian objects, Sedna is the only one not known to have a moon. 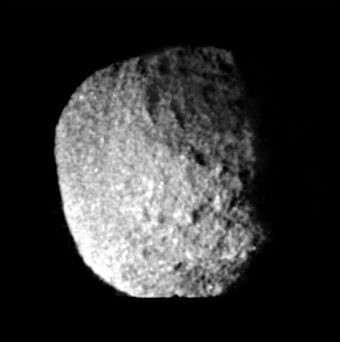 Despina, also known as Neptune V, is the third-closest inner satellite of Neptune. It is named after Greek mythological character Despoina, a nymph who was a daughter of Poseidon and Demeter. Neptune has 14 known moons, which are named for minor water deities in Greek mythology. 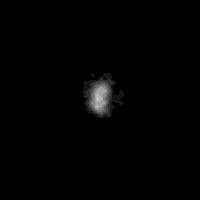 By far the largest of them is Triton, discovered by William Lassell on October 10, 1846, 17 days after the discovery of Neptune itself; over a century passed before the discovery of the second natural satellite, Nereid. Neptune's outermost moon Neso, which has an orbital period of about 26 Julian years, orbits further from its planet than any other moon in the Solar System. The rings of Neptune consist primarily of five principal rings and were first discovered on 22 July 1984 in Chile by Patrice Bouchet, Reinhold Häfner and Jean Manfroid at La Silla Observatory (ESO) during an observing program proposed by André Brahic and Bruno Sicardy from Paris Observatory, and at Cerro Tololo Interamerican Observatory by F. Vilas and L.-R. Elicer for a program led by William Hubbard. They were eventually imaged in 1989 by the Voyager 2 spacecraft. At their densest, they are comparable to the less dense portions of Saturn's main rings such as the C ring and the Cassini Division, but much of Neptune's ring system is quite tenuous, faint and dusty, more closely resembling the rings of Jupiter. Neptune's rings are named after astronomers who contributed important work on the planet: Galle, Le Verrier, Lassell, Arago, and Adams. Neptune also has a faint unnamed ring coincident with the orbit of the moon Galatea. Three other moons orbit between the rings: Naiad, Thalassa and Despina. Philip D. Nicholson is an Australian-born professor of astronomy at Cornell University in the Astronomy department specialising in Planetary Sciences. He has been editor-in-chief of the journal Icarus since 1998. 1 2 3 Hamilton, Calvin J. (4 August 2001). "Neptune". Views of the Solar System. Retrieved 13 August 2007. ↑ Walter, Elizabeth (21 April 2003). Cambridge Advanced Learner's Dictionary (2nd ed.). Cambridge University Press. ISBN 978-0-521-53106-1. ↑ Seligman, Courtney. "Rotation Period and Day Length" . Retrieved 13 August 2009. 1 2 3 4 5 6 7 8 9 10 11 12 13 14 15 16 Williams, David R. (1 September 2004). "Neptune Fact Sheet". NASA. Retrieved 14 August 2007. 1 2 3 4 5 6 Seidelmann, P. Kenneth; Archinal, Brent A.; A'Hearn, Michael F.; et al. (2007). "Report of the IAU/IAG Working Group on cartographic coordinates and rotational elements: 2006". Celestial Mechanics and Dynamical Astronomy. 98 (3): 155–80. Bibcode:2007CeMDA..98..155S. doi:10.1007/s10569-007-9072-y. 1 2 3 Munsell, K.; Smith, H.; Harvey, S. (13 November 2007). "Neptune: Facts & Figures". NASA. Retrieved 14 August 2007. ↑ Pearl, J.C.; et al. (1991). "The albedo, effective temperature, and energy balance of Neptune, as determined from Voyager data". J. Geophys. Res. 96: 18, 921–30. Bibcode:1991JGR....9618921P. doi:10.1029/91JA01087. 1 2 3 4 Mallama, A.; Hilton, J.L. (2018). "Computing Apparent Planetary Magnitudes for The Astronomical Almanac". Astronomy and Computing. 25: 10–24. arXiv: 1808.01973 . Bibcode:2018A&C....25...10M. doi:10.1016/j.ascom.2018.08.002. 1 2 Espenak, Fred (20 July 2005). "Twelve Year Planetary Ephemeris: 1995–2006". NASA. Retrieved 1 March 2008. ↑ Chang, Kenneth (18 October 2014). "Dark Spots in Our Knowledge of Neptune". New York Times . Retrieved 21 October 2014. ↑ Podolak, M.; Weizman, A.; Marley, M. (December 1995). "Comparative models of Uranus and Neptune". Planetary and Space Science. 43 (12): 1517–22. Bibcode:1995P&SS...43.1517P. doi:10.1016/0032-0633(95)00061-5. 1 2 3 4 5 6 7 8 9 10 Lunine, Jonathan I. (September 1993). "The Atmospheres of Uranus and Neptune". Annual Review of Astronomy and Astrophysics. 31: 217–63. Bibcode:1993ARA&A..31..217L. doi:10.1146/annurev.aa.31.090193.001245. 1 2 Munsell, Kirk; Smith, Harman; Harvey, Samantha (13 November 2007). "Neptune overview". Solar System Exploration. NASA. Archived from the original on 3 March 2008. Retrieved 20 February 2008. 1 2 Suomi, V.E. ; Limaye, S.S.; Johnson, D.R. (1991). "High Winds of Neptune: A possible mechanism". Science . 251 (4996): 929–32. Bibcode:1991Sci...251..929S. doi:10.1126/science.251.4996.929. PMID 17847386. 1 2 3 4 5 Hubbard, W.B. (1997). "Neptune's Deep Chemistry". Science. 275 (5304): 1279–80. doi:10.1126/science.275.5304.1279. PMID 9064785. 1 2 Nettelmann, N.; French, M.; Holst, B.; Redmer, R. "Interior Models of Jupiter, Saturn and Neptune" (PDF). University of Rostock. Archived from the original (PDF) on 18 July 2011. Retrieved 25 February 2008. 1 2 Wilford, John N. (10 June 1982). "Data Shows 2 Rings Circling Neptune". The New York Times. Retrieved 29 February 2008. ↑ Britt, Robert Roy (2009). 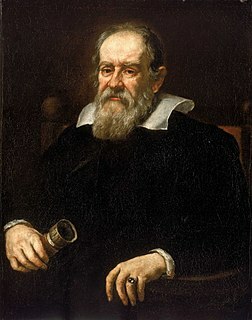 "Galileo discovered Neptune, new theory claims". MSNBC News. Archived from the original on 2010-10-02. Retrieved 10 July 2009. 1 2 3 Airy, G.B. (13 November 1846). "Account of some circumstances historically connected with the discovery of the planet exterior to Uranus". Monthly Notices of the Royal Astronomical Society. 7 (10): 121–44. Bibcode:1846MNRAS...7..121A. doi:10.1002/asna.18470251002. ↑ O'Connor, John J.; Robertson, Edmund F. (2006). "John Couch Adams' account of the discovery of Neptune". University of St Andrews. Retrieved 18 February 2008. ↑ Adams, J.C. (13 November 1846). "Explanation of the observed irregularities in the motion of Uranus, on the hypothesis of disturbance by a more distant planet". Monthly Notices of the Royal Astronomical Society . 7 (9): 149–52. Bibcode:1846MNRAS...7..149A. doi:10.1093/mnras/7.9.149. ↑ Challis, Rev. J. (13 November 1846). "Account of observations at the Cambridge observatory for detecting the planet exterior to Uranus". Monthly Notices of the Royal Astronomical Society. 7 (9): 145–49. Bibcode:1846MNRAS...7..145C. doi:10.1093/mnras/7.9.145. ↑ Galle, J.G. (13 November 1846). "Account of the discovery of the planet of Le Verrier at Berlin". Monthly Notices of the Royal Astronomical Society. 7 (9): 153. Bibcode:1846MNRAS...7..153G. doi:10.1093/mnras/7.9.153. ↑ Kollerstrom, Nick (2001). "Neptune's Discovery. The British Case for Co-Prediction". University College London. Archived from the original on 11 November 2005. Retrieved 19 March 2007. ↑ William Sheehan; Nicholas Kollerstrom; Craig B. Waff (December 2004). "The Case of the Pilfered Planet – Did the British steal Neptune?". Scientific American. Retrieved 20 January 2011. ↑ Baum, Richard; Sheehan, William (2003). In Search of Planet Vulcan: The Ghost in Newton's Clockwork Universe. Basic Books. pp. 109–10. ISBN 978-0-7382-0889-3. ↑ Gingerich, Owen (October 1958). "The Naming of Uranus and Neptune". Astronomical Society of the Pacific Leaflets. 8 (352): 9–15. Bibcode:1958ASPL....8....9G. ↑ Hind, J.R. (1847). "Second report of proceedings in the Cambridge Observatory relating to the new Planet (Neptune)". Astronomische Nachrichten. 25 (21): 309–14. Bibcode:1847AN.....25..309.. doi:10.1002/asna.18470252102. 1 2 "Planet and Satellite Names and Discoverers". Gazetteer of Planetary Nomenclature. U.S. Geological Survey. 17 December 2008. Archived from the original on 9 August 2018. Retrieved 26 March 2012. ↑ "Planetary linguistics". nineplanets.org. Retrieved 8 April 2010. ↑ "Sao Hải Vương – "Cục băng" khổng lồ xa tít tắp" (in Vietnamese). Kenh14. 31 October 2010. ↑ "Greek Names of the Planets". 2010-04-25. Retrieved 14 July 2012. Neptune or Poseidon as is its Greek name, was the God of the Seas. It is the eight planet from the sun... See also the Greek article about the planet. ↑ Ettinger, Yair (31 December 2009). 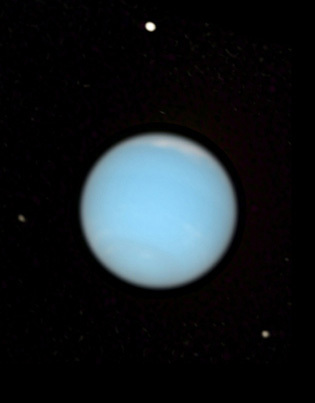 "Uranus and Neptune Get Hebrew Names at Last". Haaretz. ↑ Belizovsky, Avi (31 December 2009). "אוראנוס הוא מהיום אורון ונפטון מעתה רהב" [Uranus is now Oron and Neptune is now Rahav]. Hayadan (in Hebrew). ↑ Long, Tony (21 January 2008). 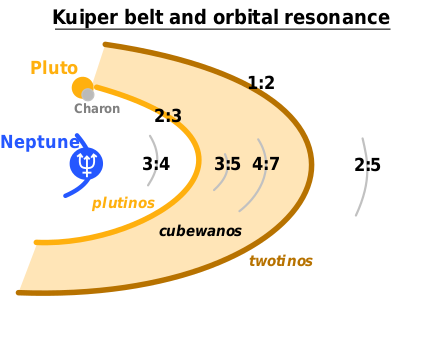 "Jan. 21, 1979: Neptune Moves Outside Pluto's Wacky Orbit". Wired. Retrieved 13 March 2008. ↑ Weissman, Paul R. (1995). "The Kuiper Belt". Annual Review of Astronomy and Astrophysics. 33: 327–57. Bibcode:1995ARA&A..33..327W. doi:10.1146/annurev.aa.33.090195.001551. 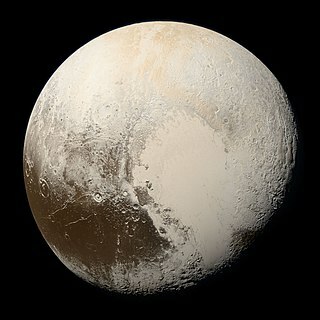 ↑ "The Status of Pluto:A clarification". International Astronomical Union, Press release. 1999. Archived from the original on 15 June 2006. Retrieved 25 May 2006. ↑ Unsöld, Albrecht; Baschek, Bodo (2001). The New Cosmos: An Introduction to Astronomy and Astrophysics. The New Cosmos : An Introduction to Astronomy and Astrophysics (5th ed.). Springer. p. 47. Bibcode:2001ncia.book.....U. ISBN 978-3-540-67877-9. See Table 3.1. 1 2 Boss, Alan P. (2002). "Formation of gas and ice giant planets". Earth and Planetary Science Letters. 202 (3–4): 513–23. Bibcode:2002E&PSL.202..513B. doi:10.1016/S0012-821X(02)00808-7. ↑ Lovis, C.; Mayor, M.; Alibert Y.; Benz W. (18 May 2006). "Trio of Neptunes and their Belt". ESO . Retrieved 25 February 2008. ↑ Atreya, S.; Egeler, P.; Baines, K. (2006). 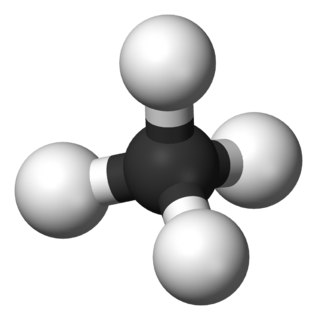 "Water-ammonia ionic ocean on Uranus and Neptune?" (PDF). Geophysical Research Abstracts. 8. 05179. ↑ Shiga, David (1 September 2010). "Weird water lurking inside giant planets". New Scientist (2776). ↑ Kerr, Richard A. (October 1999). "Neptune May Crush Methane Into Diamonds". Science. 286 (5437): 25a–25. doi:10.1126/science.286.5437.25a. PMID 10532884. ↑ Kaplan, Sarah (25 August 2017). "It rains solid diamonds on Uranus and Neptune". The Washington Post . Retrieved 27 August 2017. ↑ Kraus, D.; et al. (September 2017). "Formation of diamonds in laser-compressed hydrocarbons at planetary interior conditions". Nature Astronomy. 1 (9): 606–11. Bibcode:2017NatAs...1..606K. doi:10.1038/s41550-017-0219-9. ↑ Baldwin, Emily (21 January 2010). "Oceans of diamond possible on Uranus and Neptune". Astronomy Now. Archived from the original on 3 December 2013. ↑ Bradley, D.K. ; Eggert, J.H. ; Hicks, D.G. ; Celliers, P.M. (30 July 2004). "Shock Compressing Diamond to a Conducting Fluid" (PDF). Physical Review Letters. 93 (19): 195506. Bibcode:2004PhRvL..93s5506B. doi:10.1103/physrevlett.93.195506. PMID 15600850 . Retrieved 16 March 2016. ↑ Eggert, J.H. ; Hicks, D.G. ; Celliers, P.M.; Bradley, D.K. ; et al. (8 November 2009). "Melting temperature of diamond at ultrahigh pressure". Nature Physics. 6 (40): 40–43. Bibcode:2010NatPh...6...40E. doi:10.1038/nphys1438 . Retrieved 16 March 2016. ↑ Podolak, M.; Weizman, A.; Marley, M. (1995). "Comparative models of Uranus and Neptune". Planetary and Space Science. 43 (12): 1517–22. Bibcode:1995P&SS...43.1517P. doi:10.1016/0032-0633(95)00061-5. ↑ Crisp, D.; Hammel, H.B. (14 June 1995). "Hubble Space Telescope Observations of Neptune". Hubble News Center. Retrieved 22 April 2007. 1 2 3 4 5 Elkins-Tanton, Linda T. (2006). Uranus, Neptune, Pluto, and the Outer Solar System. New York: Chelsea House. pp. 79–83. ISBN 978-0-8160-5197-7. 1 2 3 Max, C.E. ; Macintosh, B.A. ; Gibbard, S.G.; Gavel, D.T. ; et al. (2003). "Cloud Structures on Neptune Observed with Keck Telescope Adaptive Optics". The Astronomical Journal. 125 (1): 364–75. Bibcode:2003AJ....125..364M. doi:10.1086/344943. 1 2 Encrenaz, Thérèse (February 2003). "ISO observations of the giant planets and Titan: what have we learnt?". Planetary and Space Science. 51 (2): 89–103. Bibcode:2003P&SS...51...89E. doi:10.1016/S0032-0633(02)00145-9. ↑ Broadfoot, A.L. ; Atreya, S.K. ; Bertaux, J.L. ; et al. (1999). "Ultraviolet Spectrometer Observations of Neptune and Triton" (PDF). Science. 246 (4936): 1459–66. Bibcode:1989Sci...246.1459B. doi:10.1126/science.246.4936.1459. PMID 17756000. ↑ Herbert, Floyd; Sandel, Bill R. (August–September 1999). "Ultraviolet observations of Uranus and Neptune". Planetary and Space Science. 47 (8–9): 1, 119–39. Bibcode:1999P&SS...47.1119H. doi:10.1016/S0032-0633(98)00142-1. ↑ Stanley, Sabine; Bloxham, Jeremy (11 March 2004). "Convective-region geometry as the cause of Uranus' and Neptune's unusual magnetic fields". Nature. 428 (6979): 151–53. Bibcode:2004Natur.428..151S. doi:10.1038/nature02376. PMID 15014493. ↑ Connerney, J.E.P. ; Acuña, Mario H.; Ness, Norman F. (1991). "The magnetic field of Neptune". Journal of Geophysical Research. 96: 19, 023–42. Bibcode:1991JGR....9619023C. doi:10.1029/91JA01165. 1 2 Ness, N.F. ; Acuña, M.H. ; Burlaga, L.F.; Connerney, J.E.P. ; Lepping, R.P. ; Neubauer, F.M. (1989). "Magnetic Fields at Neptune". Science. 246 (4936): 1473–78. Bibcode:1989Sci...246.1473N. doi:10.1126/science.246.4936.1473. PMID 17756002. ↑ Russell, C.T. ; Luhmann, J.G. (1997). "Neptune: Magnetic Field and Magnetosphere". University of California, Los Angeles. Retrieved 10 August 2006. ↑ Hammel, H.B. ; Beebe, R.F. ; De Jong, E.M.; Hansen, C.J. ; et al. (1989). "Neptune's wind speeds obtained by tracking clouds in Voyager 2 images". Science. 24 (4924): 1367–69. Bibcode:1989Sci...245.1367H. doi:10.1126/science.245.4924.1367. PMID 17798743. 1 2 Lavoie, Sue (16 February 2000). 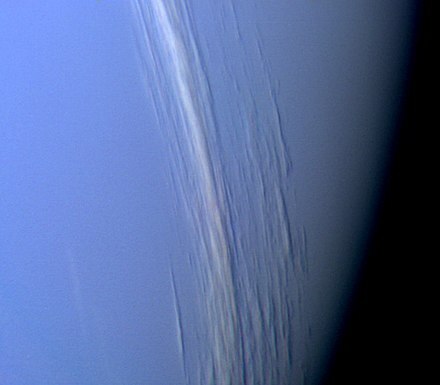 "PIA02245: Neptune's blue-green atmosphere". NASA JPL. Retrieved 28 February 2008. ↑ "A storm is coming". www.spacetelescope.org. Retrieved 19 February 2019. ↑ Orton, G.S. ; Encrenaz T.; Leyrat C.; Puetter, R.; et al. (2007). "Evidence for methane escape and strong seasonal and dynamical perturbations of Neptune's atmospheric temperatures". Astronomy and Astrophysics. 473 (1): L5–L8. Bibcode:2007A&A...473L...5O. doi:10.1051/0004-6361:20078277. 1 2 Villard, Ray; Devitt, Terry (15 May 2003). "Brighter Neptune Suggests A Planetary Change Of Seasons". Hubble News Center. Retrieved 26 February 2008. ↑ Hammel, H.B. ; Lockwood, G.W. ; Mills, J.R.; Barnet, C.D. (1995). "Hubble Space Telescope Imaging of Neptune's Cloud Structure in 1994". Science. 268 (5218): 1740–42. Bibcode:1995Sci...268.1740H. doi:10.1126/science.268.5218.1740. PMID 17834994. ↑ "Neptune's shrinking vortex". www.spacetelescope.org. Retrieved 19 February 2018. ↑ S.G., Gibbard; de Pater, I.; Roe, H.G. ; Martin, S.; et al. (2003). "The altitude of Neptune cloud features from high-spatial-resolution near-infrared spectra" (PDF). Icarus. 166 (2): 359–74. Bibcode:2003Icar..166..359G. doi:10.1016/j.icarus.2003.07.006. Archived from the original (PDF) on 20 February 2012. Retrieved 26 February 2008. ↑ Stratman, P.W. ; Showman, A.P. ; Dowling, T.E. ; Sromovsky, L.A. (2001). "EPIC Simulations of Bright Companions to Neptune's Great Dark Spots" (PDF). Icarus. 151 (2): 275–85. Bibcode:1998Icar..132..239L. doi:10.1006/icar.1998.5918 . Retrieved 26 February 2008. ↑ Sromovsky, L.A.; Fry, P.M.; Dowling, T.E. ; Baines, K.H. (2000). 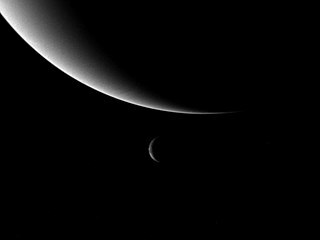 "The unusual dynamics of new dark spots on Neptune". Bulletin of the American Astronomical Society. 32: 1005. Bibcode:2000DPS....32.0903S. ↑ "Happy birthday Neptune". ESA/Hubble. Retrieved 13 July 2011. ↑ Lindal, Gunnar F. (1992). "The atmosphere of Neptune – an analysis of radio occultation data acquired with Voyager 2". Astronomical Journal. 103: 967–82. Bibcode:1992AJ....103..967L. doi:10.1086/116119. ↑ "Class 12 – Giant Planets – Heat and Formation". 3750 – Planets, Moons & Rings. Colorado University, Boulder. 2004. Retrieved 13 March 2008. ↑ Pearl, J.C.; Conrath, B.J. (1991). "The albedo, effective temperature, and energy balance of Neptune, as determined from Voyager data". Journal of Geophysical Research: Space Physics. 96: 18, 921–30. Bibcode:1991JGR....9618921P. doi:10.1029/91ja01087. ↑ Imke de Pater and Jack J. Lissauer (2001), Planetary Sciences , 1st edition, p. 224. ↑ McKie, Robin (9 July 2011). "Neptune's first orbit: a turning point in astronomy". The Guardian. ↑ "Neptune Completes First Orbit Since Discovery: 11th July 2011 (at 21:48 U.T.±15min)". 1 July 2011. Retrieved 10 July 2011. 1 2 Anonymous (16 November 2007). "Horizons Output for Neptune 2010–2011". Archived from the original on 2 May 2013. Retrieved 25 February 2008. —Numbers generated using the Solar System Dynamics Group, Horizons On-Line Ephemeris System. ↑ Williams, David R. (6 January 2005). "Planetary Fact Sheets". NASA. Retrieved 28 February 2008. ↑ Hubbard, W.B. ; Nellis, W.J. ; Mitchell, A.C.; Holmes, N.C.; et al. (1991). "Interior Structure of Neptune: Comparison with Uranus". Science. 253 (5020): 648–51. Bibcode:1991Sci...253..648H. doi:10.1126/science.253.5020.648. PMID 17772369. ↑ Stern, S. Alan; Colwell, Joshua E. (1997). "Collisional Erosion in the Primordial Edgeworth-Kuiper Belt and the Generation of the 30–50 AU Kuiper Gap". The Astrophysical Journal. 490 (2): 879–82. Bibcode:1997ApJ...490..879S. doi:10.1086/304912. ↑ Petit, Jean-Marc; Morbidelli, Alessandro; Valsecchi, Giovanni B. (1999). "Large Scattered Planetesimals and the Excitation of the Small Body Belts" (PDF). Icarus. 141 (2): 367–87. Bibcode:1999Icar..141..367P. doi:10.1006/icar.1999.6166. Archived from the original (PDF) on 1 December 2007. Retrieved 23 June 2007. ↑ "List Of Transneptunian Objects". Minor Planet Center. Retrieved 25 October 2010. ↑ Jewitt, David (2004). "The Plutinos". UCLA. Retrieved 28 February 2008. ↑ Varadi, F. (1999). "Periodic Orbits in the 3:2 Orbital Resonance and Their Stability". The Astronomical Journal. 118 (5): 2526–31. Bibcode:1999AJ....118.2526V. doi:10.1086/301088. ↑ John Davies (2001). Beyond Pluto: Exploring the outer limits of the solar system. Cambridge University Press. p. 104. ISBN 978-0-521-80019-8. ↑ Chiang, E.I. ; Jordan, A.B. ; Millis, R.L. ; M.W. Buie; et al. (2003). "Resonance Occupation in the Kuiper Belt: Case Examples of the 5 : 2 and Trojan Resonances". The Astronomical Journal. 126 (1): 430–43. arXiv: astro-ph/0301458 . Bibcode:2003AJ....126..430C. doi:10.1086/375207. ↑ Sheppard, Scott S.; Trujillo, Chadwick A. (10 September 2010). "Detection of a Trailing (L5) Neptune Trojan". Science . 329 (5997): 1304. Bibcode:2010Sci...329.1304S. doi:10.1126/science.1189666. PMID 20705814. 1 2 De La Fuente Marcos, C. & De La Fuente Marcos, R. (2012). "(309239) 2007 RW10: a large temporary quasi-satellite of Neptune". Astronomy and Astrophysics Letters. 545 (2012): L9. arXiv: 1209.1577 . Bibcode:2012A&A...545L...9D. doi:10.1051/0004-6361/201219931. ↑ Thommes, Edward W.; Duncan, Martin J.; Levison, Harold F. (2002). "The formation of Uranus and Neptune among Jupiter and Saturn". The Astronomical Journal. 123 (5): 2862–83. arXiv: astro-ph/0111290 . Bibcode:2002AJ....123.2862T. doi:10.1086/339975. ↑ Hansen, Kathryn (7 June 2005). "Orbital shuffle for early solar system". Geotimes. Retrieved 26 August 2007. ↑ Crida, A. (2009). Solar System formation. Reviews in Modern Astronomy. 21. p. 3008. arXiv: 0903.3008 . Bibcode:2009RvMA...21..215C. doi:10.1002/9783527629190.ch12. ISBN 978-3-527-62919-0. ↑ Desch, S.J. (2007). "Mass Distribution and Planet Formation in the Solar Nebula". The Astrophysical Journal. 671 (1): 878–93. Bibcode:2007ApJ...671..878D. doi:10.1086/522825. ↑ Smith, R.; L.J. Churcher; M.C. Wyatt; M.M. Moerchen; et al. (2009). "Resolved debris disc emission around η Telescopii: a young solar system or ongoing planet formation?". Astronomy and Astrophysics. 493 (1): 299–308. arXiv: 0810.5087 . Bibcode:2009A&A...493..299S. doi:10.1051/0004-6361:200810706. ↑ Agnor, Craig B.; Hamilton, Douglas P. (2006). "Neptune's capture of its moon Triton in a binary–planet gravitational encounter". Nature. 441 (7090): 192–94. Bibcode:2006Natur.441..192A. doi:10.1038/nature04792. PMID 16688170. ↑ Chyba, Christopher F.; Jankowski, D.G. ; Nicholson, P.D. (1989). "Tidal evolution in the Neptune-Triton system". Astronomy and Astrophysics. 219 (1–2): L23–L26. Bibcode:1989A&A...219L..23C. ↑ Wilford, John N. (29 August 1989). "Triton May Be Coldest Spot in Solar System". The New York Times. Retrieved 29 February 2008. ↑ Nelson, R.M. ; Smythe, W.D. ; Wallis, B.D. ; Horn, L.J. ; et al. (1990). "Temperature and Thermal Emissivity of the Surface of Neptune's Satellite Triton". Science. 250 (4979): 429–31. Bibcode:1990Sci...250..429N. doi:10.1126/science.250.4979.429. PMID 17793020. 1 2 Stone, E.C. ; Miner, E.D. (1989). "The Voyager 2 Encounter with the Neptunian System". Science. 246 (4936): 1417–21. Bibcode:1989Sci...246.1417S. doi:10.1126/science.246.4936.1417. PMID 17755996. ↑ Brown, Michael E. "The Dwarf Planets". California Institute of Technology, Department of Geological Sciences. Retrieved 9 February 2008. ↑ Holman, M.J.; Kavelaars, J.J.; Grav, T.; et al. (2004). "Discovery of five irregular moons of Neptune" (PDF). Nature. 430 (7002): 865–67. Bibcode:2004Natur.430..865H. doi:10.1038/nature02832. PMID 15318214 . Retrieved 24 October 2011. ↑ "Five new moons for planet Neptune". BBC News. 18 August 2004. Retrieved 6 August 2007. ↑ Grush, Loren (2019-02-20). "Neptune's newly discovered moon may be the survivor of an ancient collision". The Verge. Retrieved 2019-02-22. ↑ Blue, Jennifer (8 December 2004). "Nomenclature Ring and Ring Gap Nomenclature". Gazetteer of Planetary Nomenclature. USGS. Retrieved 28 February 2008. ↑ Guinan, E.F.; Harris, C.C. ; Maloney, F.P. (1982). "Evidence for a Ring System of Neptune". Bulletin of the American Astronomical Society. 14: 658. Bibcode:1982BAAS...14..658G. ↑ Goldreich, P.; Tremaine, S.; Borderies, N.E.F. (1986). "Towards a theory for Neptune's arc rings". Astronomical Journal. 92: 490–94. Bibcode:1986AJ.....92..490G. doi:10.1086/114178. ↑ Nicholson, P.D. ; et al. (1990). "Five Stellar Occultations by Neptune: Further Observations of Ring Arcs". Icarus. 87 (1): 1–39. Bibcode:1990Icar...87....1N. doi:10.1016/0019-1035(90)90020-A. ↑ Munsell, Kirk; Smith, Harman; Harvey, Samantha (13 November 2007). "Planets: Neptune: Rings". Solar System Exploration. NASA. Retrieved 29 February 2008. ↑ Salo, Heikki; Hänninen, Jyrki (1998). "Neptune's Partial Rings: Action of Galatea on Self-Gravitating Arc Particles". Science. 282 (5391): 1102–04. Bibcode:1998Sci...282.1102S. doi:10.1126/science.282.5391.1102. PMID 9804544. ↑ "Neptune's rings are fading away". New Scientist. 26 March 2005. Retrieved 6 August 2007. ↑ In 1977, for example, even the rotation period of Neptune remained uncertain. Cruikshank, D.P. (1 March 1978). "On the rotation period of Neptune". Astrophysical Journal Letters. 220: L57–L59. Bibcode:1978ApJ...220L..57C. doi:10.1086/182636. ↑ Max, C.; MacIntosh, B.; Gibbard, S.; Roe, H.; et al. (1999). "Adaptive Optics Imaging of Neptune and Titan with the W.M. 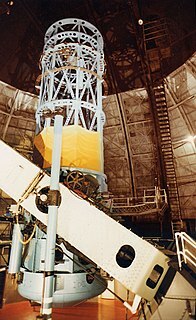 Keck Telescope". Bulletin of the American Astronomical Society. 31: 1512. Bibcode:1999AAS...195.9302M. ↑ Nemiroff, R.; Bonnell, J., eds. (18 February 2000). "Neptune through Adaptive Optics". Astronomy Picture of the Day . NASA. ↑ Gibbard, S.G.; Roe, H.; de Pater, I.; Macintosh, B.; et al. (1999). "High-Resolution Infrared Imaging of Neptune from the Keck Telescope". Icarus. 156 (1): 1–15. Bibcode:2002Icar..156....1G. doi:10.1006/icar.2001.6766. ↑ Phillips, Cynthia (5 August 2003). "Fascination with Distant Worlds". SETI Institute. Archived from the original on 3 November 2007. Retrieved 3 October 2007. ↑ Chris Gebhardt; Jeff Goldader (20 August 2011). "Thirty-four years after launch, Voyager 2 continues to explore". NASASpaceflight. 1 2 Clark, Stephen (25 August 2015). "Uranus, Neptune in NASA's sights for new robotic mission". Spaceflight Now. Retrieved 7 September 2015. ↑ Spilker, T.R. ; Ingersoll, A.P. (2004). "Outstanding Science in the Neptune System From an Aerocaptured Vision Mission". Bulletin of the American Astronomical Society. 36: 1094. Bibcode:2004DPS....36.1412S. ↑ Candice Hansen; et al. "Argo – A Voyage Through the Outer Solar System" (PDF). SpacePolicyOnline.com. Space and Technology Policy Group, LLC. Retrieved 5 August 2015.